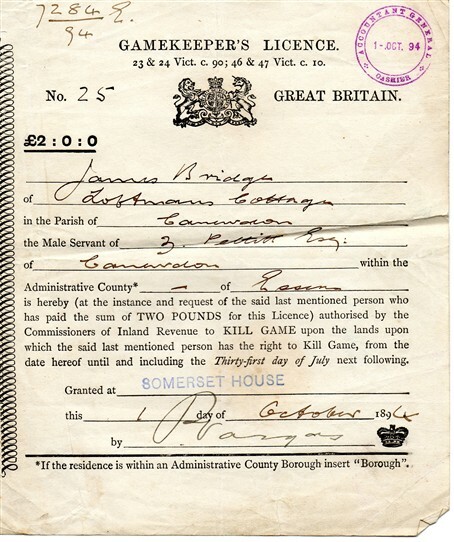 My great grandfather, James Bridge, was born well before the beginning of the last century and was working as a gamekeeper in Canewdon in the 1880s. His son, also James Bridge, was born in 1879. James junior stayed for a time in the Chequers at Canewdon with his uncle and aunt Mr and Mrs Codlin. 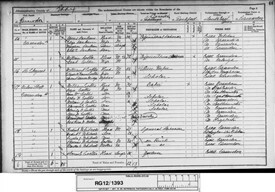 James Bridge jnr was then about 11 years old and is shown on the census as being at school - he was a "scholar" in fact. 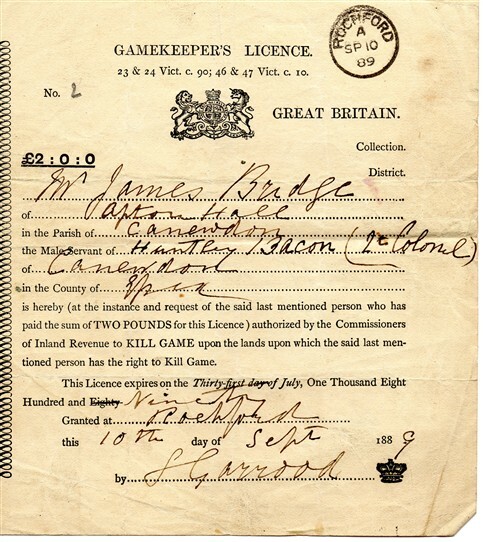 James eventually also became a gamekeeper and moved from the area. When WW1 broke out he was in Herefordshire and was then 36 years old, married and with 3 children. 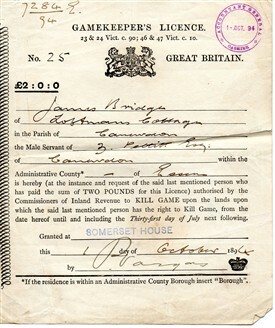 James enlisted in the army in June 1916. He survived the war and his complicated story has been well researched, see the article James Bridge - WW1 Service. Contact with James during WW1 was sporadic. He sent a Xmas card from Italy in 1918 just after the armistice was signed, see the article James Bridge - Xmas Card. This page was added by Bob Stephen on 27/07/2018. Hello Richard, I don't know why he wanted the ferry on this particular occasion but as I understand it, a customer would sound the bell, which would carry to the opposite bank and a passenger ferry would go across to pick them up but if a horse ferry was wanted, then the bells were pulled and the signal arm lifted. As an interesting side note to this is Huntley Bacon as listed as James Bridge’s employer at Apton Hall. He described himself as a ‘Lieutenant-Colonel’ but there is no record of him ever attaining this rank! His final military record states that on 13th May 1882 he was granted the honorary rank of ‘Major’ when he was placed on the ‘retired’ list. He is also named as a ‘Major’ when acting as executor to the previous owner of Apton Hall Henry Mew. 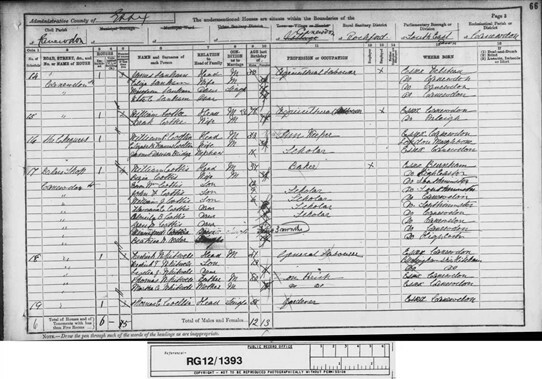 Huntley Bacon was also Henry Mew’s beneficiary via his father’s (also named Huntley) marriage to Henry Mew’s only heir, his daughter Harriet. The Bacon family money had come from being successful London silkmen and merchants with premises in Bishopsgate Street. 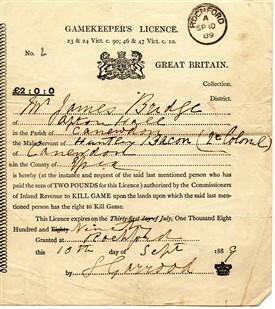 How very interesting about James Bridge, gamekeeper license £2 way back then! What the signal used for by your grandfather. ?